In 2002 Neubau published NB-55MS™ Postscript Specimen, a commission presented at the exhibition ‘Postscript: zur Form von Schrift heute’, A/CH/D, Künstlerhaus Wien, Vienna. The project consisted of an exposition and successive publication which questioned the future of postscript typefaces. 30 leading international type designers were invited to contribute a poster in the size of 70 × 100 cm. Neubau’s contribution resembled the dry transferable lettering system sheets known from a design past, consisting of seventy original components designed and edited by the studio. The result – NB-55MS™ Postscript Specimen – manifests itself as an embedded, structuralist discourse on the future of postscript typefaces and poster design. 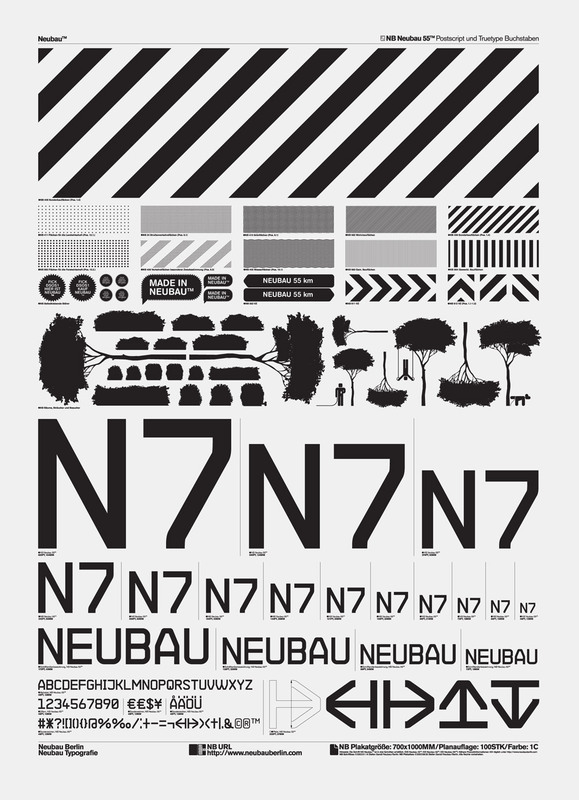 Using these methods allows Neubau to scrutinise its own graphic design ideologies and develop a unique in-house graphic design research programme. Referencing and remixing the past positions Neubau at the forefront of designing for the present and declares the studio as a stakeholder in designing and building for the future.